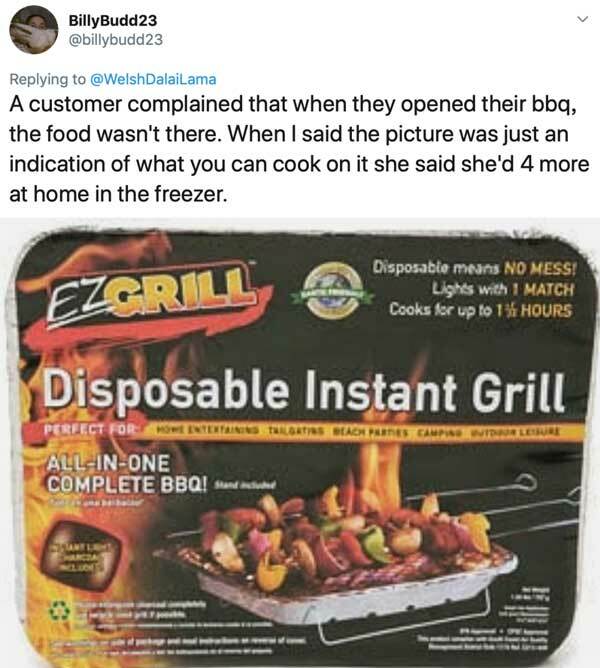 Recently, Twitter user WelshDalaiLama asked the internet to give them a time when the customer was totally wrong. Honestly, you’ll feel bad for the employees who had to deal with these people. Worked in a hotel for a while. Couple tried to check in, I couldn’t find a record of their booking. Bafflement ensued, and obviously it’s my fault we’ve lost the booking. Then they realised they’d turned up a day early. I used to work in a tearoom type cafe. A customer sent a scone back to the kitchen, claiming there was too much cream on the scone. The jam and cream was served seperate. He had put it on himself. Working at Borders there’s a kid going nuts on the bargain books which had noisemakers. After 30 min a woman complains to me about how adults weren’t disciplining their kids correctly. 15 noisy minutes later she decides to confront the kid – which she realized in shock was HERS. Customer: I’d like a cappuccino – no chocolate on top, no foam and no milk. Me: … so you’d like a black coffee? Customer: No, I only like cappuccino. I WANT a cappuccino! Client comes in asking for a specific product. I apologize and let her know we don’t carry that brand. Client flips out, all but calls me stupid. Tells me that she knows EVERY Ulta carries this product. 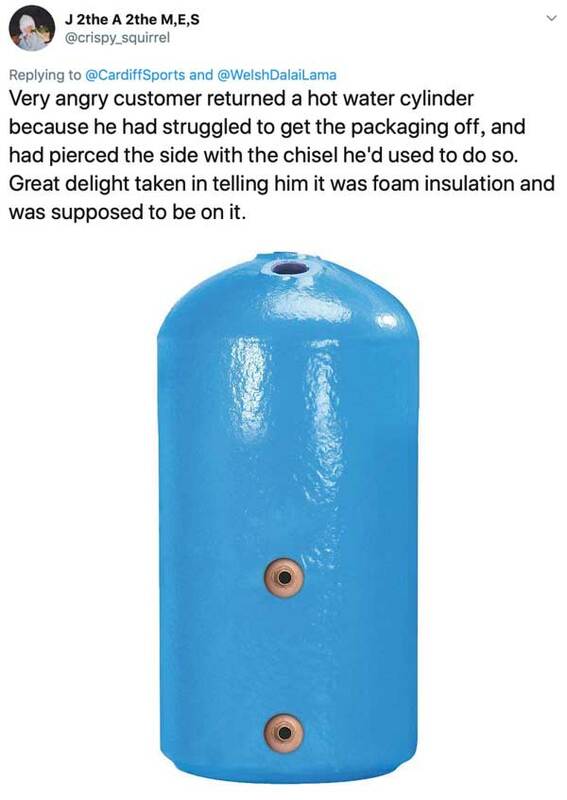 Got called out because the owner said he could smell carbon monoxide coming from his boiler. Tried to explain. He’s was having none of it. Worked in Pizza Hut call centre dealing with complaints. Had a customer scream at me for ten minutes that her local Pizza Hut store didn’t have her order which she placed by phone. The order which, it turns out, she placed with Dominos. Had a customer ask if we sell DVDs because she wanted a copy of “Harry Potter and the Chamber Of Commerce”. Another asked for “The Hounds of Hell” by Kate Bush. Pretty much every day in a record shop. I once worked as a banker. A customer railed at me because their debit card wasn’t working.